Submitting expenses is often a tedious and inefficient task for employees and finance departments alike. Application leaders should evaluate how modern travel and expense management applications can improve the end-user experience and add business value for the organization. Artificial intelligence, machine learning, and natural language processing – what do these words really mean? And what do they have to do with corporate travel? Deem’s new ebook answers these questions and more. It takes a look at the way AI can give travelers the booking experience they dream of – flights, hotel, ground transportation, and everything else needed all at once. 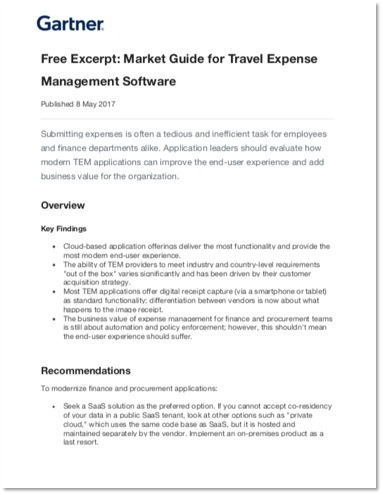 Download a free excerpt of IDC's MarketScape on worldwide SaaS and cloud-enabled travel and expense management applications 2018. Digital transformation (DX) is fundamentally changing software applications, allowing businesses to transform their decision making — which is enhancing their business outcomes significantly as we enter the digital economy. Deem’s white paper finds the five key answers to corporate traveler satisfaction. The special report looks at the challenges and opportunities facing travel managers in a new self-service environment, particularly regarding traveler preference, policy and compliance violation and maintaining duty of care. It is a time where the travel market is dominated by one player who is dictating the future of online booking tools. The world of corporate travel is eager for an alternative who listens and responds. And so arrives the Rebel Force - Deem.